Radar Zero recently attended CoinDesk's Consensus 4th annual blockchain technology summit at the New York Hilton, May 14-16. Our take? It was a zoo. The program was slated for 2,000 attendees. More than 8,500 individuals attended. Crypto and Blockchain Are Bold Business. Just Gearing Up to Change the World. Think Bitcoin and blockchain are big? They're bombastic. And the journey has just begun. Forget those who call crypto world a bubble. Even if it were - that bubble is nowhere near bursting. Thirteen years ago, CoinDesk attracted 400 attendees to its 2005 conference. The year after, it added 1,000 attendees. And the year after that, 1,300. Last week, it somehow packed in an additional 5,800 participants. 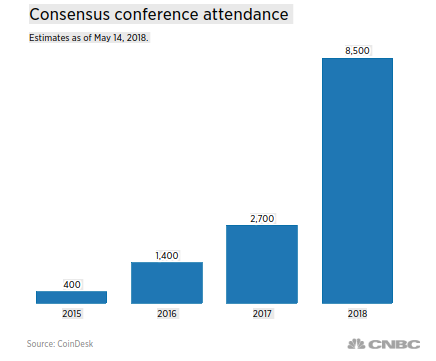 That's more than triple the 2,700 attendees CoinDesk reported for the May 2017 conference! If that isn't enough to convince you, at least 20 “copycats” staged their own events at the same time, also attracting large crowds. Tickets for Consensus ran 2k-3k a piece. Organizers of smaller events ran their tickets from several hundreds to thousands. Most of these organizations reported booming success. Consensus, of course, was packed to the gills. Blockchain rather than Bitcoin defines the future. Bitcoin may or may not survive in its current form. It has too many challenges that include Bitcoin fluctuation, low adoption, and stunted mass appeal. Over the last few years, organizations like Microsoft, Wordpress, Mozilla, and Wikipedia that accepted Bitcoin in the past, have hid or removed their Bitcoin donation options. Most of the 45,000 merchants that Coinbase says integrate Bitcoin, stopped accepting it, according to crypto blogger Arcturnus. Blockchain’s smart contracts, in contrast, are another story. To date, blockchain is mulled upon by more than half of the world's big corporations, according to a study by U.K. research firm Juniper Research. Two thirds of firms say they expect the technology to be integrated into their systems by the end of 2018. Governments use it or plan to in the near future. In addition to the FedEx panel, a handful of enterprise-focused firms including Accenture, Deloitte, and IBM touted their progress with enterprise blockchain solutions on the Consensus exhibit floor. Crypto was on display: There were crypto wallets, crypto trading platforms, crypto consulting firms, tools for crypto investors, crypto law and so forth. But the emphasis was on blockchain rather than on Bitcoin or any of the other major cryptocurrencies. The New Crowd. Or, Dreamers become Establishment. Blockchain started off with dreamers and idealists bent on programming a country-to-country ledger that would change the world. Radar Zero’s first few profiles included the Free Republic of Liberland with no tax system, no borders, and no physical currency. We also interviewed David Zimbeck, smart contract pioneer, who spoke of a blockchain-created utopian universe and profiled the crypto-anarchists in Puerto Rico. The days of the indie may be dwindling though. Based on what we saw at Consensus, the mainstream is taking over blockchain. The speakers at Consensus and the price of the tickets said it all. Twitter co-founder Jack Dorsey, whose mobile payments company Square launched Bitcoin trading this year, spoke at Consensus on Wednesday. Other conference panelists ranged from government officials to start-up leaders. Nowhere in sight were the techno-utopians or techno-anarchists so set and eager to take over the world. Second, the tickets cost a mighty $2,000 USD per attendee. In the democratic spirit of crypto anarchism, Ethereum’s co-founder Vitalik Biturin boycotted the event. Bitcoin and blockchain were developed to level the field. Satoshi Nakamoto, Bitcoin’s shadowy creator, wanted to gatecrash governments and corporations. For all the hype of blockchain “banking the unbanked," Consensus showed who had won: government, banks and corporations. Good question. The old guard is gone. It’s a bold new future, with a blockchain boom and capitalists controlling its purse strings.